Cottages and pool at Croft Farm, for residential swimming lessons. For the first time ever I was able to play with my granddaughters and not sit on the top step clinging to the side - they couldn't believe it! I can't tell you how grateful I am that you helped me overcome my fear of the water. We have exclusive use of the pool at croft farm for your lessons, which makes a big difference to your learning experience – privary, peace and quiet. In the perfect setting of quality holiday cottages on the West Wales coast you can refresh yourself between lessons (in the pool or out). With our hands-on, one-to-one tuition using the Alexander Technique, you’ll be surprised how much you can learn during your stay. You’ll appreciate and enjoy the learning process and take away knowledge that’ll stay with you forever. Croft Farm is just outside the market town of Cardigan, where the Pembrokeshire National Park meets Cardigan Bay. A beautiful but undiscovered part of Wales with stunning rural and coastal scenery – long sandy beaches, sheltered coves, rolling hills, lush valleys and clean rivers. The heated, indoor pool is long enough to work on your swimming technique but, for people who are nervous in the water, there’s no daunting deep end or sloping floors. You’ll stay with our friends at Croft Farm in a 4 or 5 star cottage, a stone’s throw from the pool. Set in 8 acres of open green fields – a farm holiday but with spotless, luxury self-catering cottages and private leisure complex. We teach at Croft Farm all year round, term time and generally weekdays only. 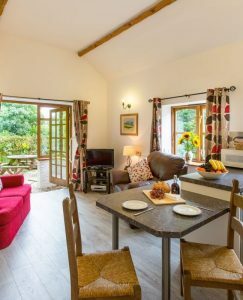 Cottage prices start at £326 for one person/ £346 for two, for 4 nights in low season (November to March) in a small cottage (Granary is the most popular for singles and couples, pictured). Courses are residential only. It’s on this basis that we get exclusive use of the excellent pool facility.